Heat oven to 350°F. Spray 2 (6-oz) custard cups with cooking spray. Place biscuits on microwavable plate. Microwave uncovered on High 10 seconds. Turn over, and microwave an additional 10 to 15 seconds, if necessary, until biscuits are softened. Press and stretch each into 5-inch round, using floured fingers if needed. Place 1 biscuit in each custard cup, pressing into bottom and up side of each. In small bowl, mix filling ingredients. Divide evenly between biscuit-lined cups. In small bowl, mix oats, flour, brown sugar and cinnamon. With fork, cut in butter until mixture looks like coarse crumbs. Sprinkle over filling. Place custard cups on cookie sheet. Bake 20 to 25 minutes or until edges are golden brown and filling bubbles around edges; cool 5 minutes. Remove from custard cups; place on cooling rack. Cool 10 minutes. 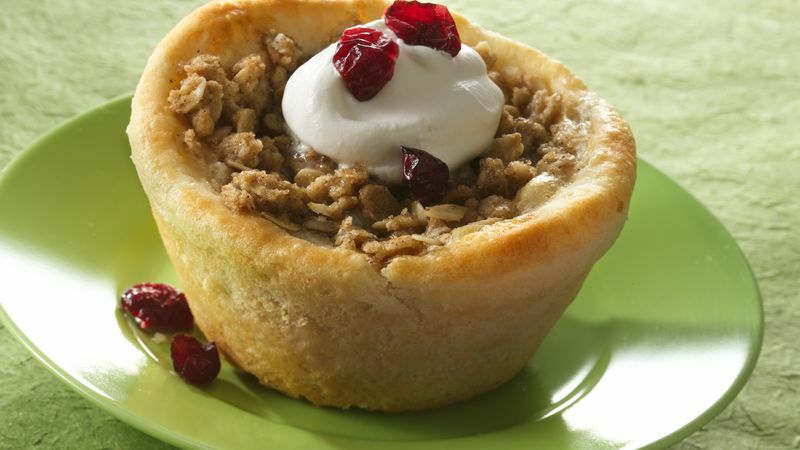 Top with whipped topping and chopped cranberries. Drizzle with a little caramel topping to make the pies even more amazing.